Born 1895, Jalisco, Mexico; died 1963, Auburn, California. Born in Tepatilan, Jalisco, Mexico in 1895, Martín Ramírez was a rancher and a family man, until poverty and political violence drove him to California in search of migrant work in 1925. Like many Mexican immigrants, he suffered great hardship, but his story is anything but typical. In 1931 Ramírez was diagnosed with catatonic schizophrenia and committed to state hospitals, first in Stockton, and then at the DeWitt State Hospital in Auburn. 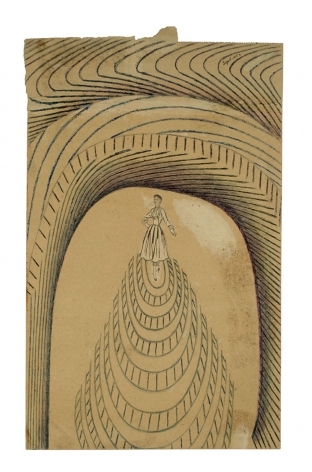 He began to draw in the 1930s, using unlikely materials culled from hospital supplies. Erroneously labeled a chronic mute, Ramírez flourished as an artist until his death in 1963, producing an impressive body of over 300 large-scale, mixed-media drawings. This oeuvre would have been lost if not for the advocacy Dr. Tarmo Pasto, a Sacramento psychiatrist who met the artist after his move to DeWitt. Pasto offered him encouragement, some supplies, and later archived and exhibited his work. Ramirez, Martin, Martín Ramírez: Reframing Confinement, exhibition catalogue, Museo Nacional Centro de Arte Reina Sofia, Madrid, 2010. Anderson, Brooke D., Martín Ramírez, Richard Rodriguez, and Wayne Thiebaud, Martín Ramírez: The Last Works, Ricco/Maresca Gallery, exhibition catalogue, New York, 2008. Anderson, Brooke D., Victor M. Espinosa, and Martín Ramirez, Martín Ramírez, exhibition catalogue, American Folk Art Museum, New York, 2007. Dubuffet & Art Brut, exhibition catalogue, 5 Continents Editions & Museum Kunst Palast, Düsseldorf, 2005. Martín Ramírez: Pintor Mexicano (1885-1960), exhibition catalogue, Centro Cultural/Arte Contemporáneo, Mexico City, 1989. Bowman, Russell, et al., The Heart of Creation: The Art of Martín Ramírez, exhibition catalogue, Goldie Paley Gallery, Moore College of Art, Philadelphia, 1985.
homemade bowls of hardened oatmeal. His isolated figures and scenes are often dramatically framed by his signature proscenium device: lively gauchos from the Mexico of his youth, stately Madonnas, trains disappearing into underworld tunnels, animals, a lone figure seated in contemplation, possibly a self-portrait. Onto more complex works, he layered collaged images from print sources. Recently discovered drawings made in the final years of his life reveal a bolder use of color, and riskier, more abstract compositions driven by his confident, undulating line. Resonating with visual and symbolic elements from the artist’s indigenous Mexican roots, his Catholic sensibility, his travels, and his pure love of line, color and form, Ramírez’s achievement is far greater than the sum of these distinct parts.